World Cup winners Ronaldinho and Kaka were both left out of the Brazil's Confederations Cup squad on Tuesday as coach Luiz Felipe Scolari opted for youth ahead of experience. Manchester United fullback Rafael and Chelsea midfielder Ramires, who has been a regular for his country over the past years, were also excluded and there was no place for former AC Milan striker Alexandre Pato. Brazil will use the same squad for the friendlies against England in Rio de Janeiro on June 2 and France in Belo Horizonte one week later. The Brazilians had been expected to take at least one of Kaka and Ronaldinho, who were in the 2002 World Cup winning squad coached by Scolari, to the eight-team competition which they host in June. Ronaldinho, 33, had been a favourite thanks to some inspirational performances for his club Atletico Mineiro but they were clearly insufficient to impress the man known as Big Phil. "We could lose out in terms of experience but we will make up for that with the enthusiasm which the young players bring," Scolari told a news conference of around 300 reporters at a Rio de Janeiro hotel. "If a player is not in the squad, it means I have doubts about him. If he is in the squad, it means I don't have any doubts. Scolari took over in November after Mano Menezes was surprisingly sacked and has managed only one win, away to Bolivia, in his five friendlies in charge. Ronaldinho played in three of those games. "When I chose the squad, I analyse what I can win and what I can lose with each player and I make my choices," said Scolari. "When it comes to discipline, I base my choices on the way the player has behaved with the Brazil team and what has happened with us in the five friendlies." Ronaldinho was taken off at halftime in the friendly against England in February after an apathetic performance in which he missed a penalty. He also played in the 4-0 win in Bolivia and 2-2 draw at home to Chile, where Brazil were jeered off the field. 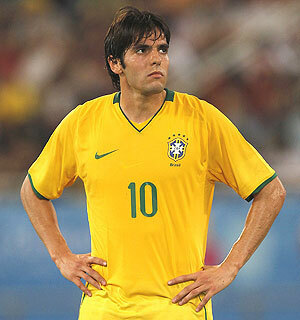 Real Madrid's Kaka produced low-key performances against Italy and Russia. Scolari said he did not fear a backlash from Brazilian fans for omitting Ronaldinho, who remains hugely popular. "If we don't do well, we'll be under the cosh whoever I picked," he said. Scolari has already made it clear that most of the players at the Confederations Cup will form the basis of his World Cup squad next year, when Brazil will attempt to win a sixth world title on home soil. The biggest surprise was the inclusion of 20-year-old Atletico Mineiro striker Bernard, who has only one cap. Brazil face Japan, Italy and Mexico in their group. Forwards: Hulk (Zenit StPetersburg), Bernard (Atletico Mineiro), Leandro Damiao (Internacional), Fred (Fluminense), Neymar (Santos), Jadson (Sao Paulo).